Typically, robotic algorithms focus on tasks which have concrete, functional objectives. Our framework aims to allow for more general specification based on stylistic considerations. Namely, we may think of the movement styles exhibited by classical ballerinas, disco dancers, and cheerleaders as differentiated by distinct stylistic tasks. The animations below assemble the sequencing framework and the trajectory modulation discussed in the following two sections. 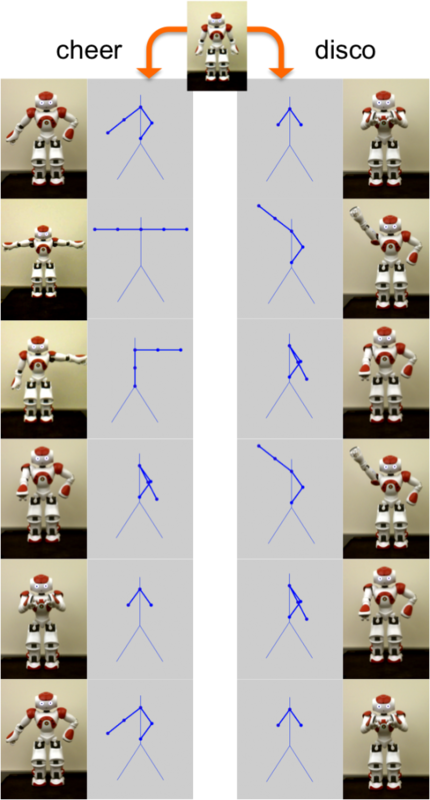 Combined, our methods produce movement sequences with pose sequences that are consistent within each style and with trajectories – movements between those poses – which are consistent with a desired movement quality – thus answering the questions: ‘Which movements are allowed?’ and ‘How should they be executed?’ respectively. Allowable transitions are described by an automata while the trajectories corresponding to each transition are found as the solution to an optimal control problem with style sensitive weights. The animation on the left shows our cheerleading behavior with the parameters we’ve enumerated to describe it. On the right is the disco behavior. 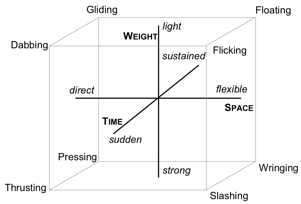 Notice that each behavior exhibits different movement styles, i.e. the sequencing of poses and the quality of transitions are distinct. Dancers have long studied how to modify movements to produce motion sequences that have desired stylistic properties. In this work we pair dance theoretician, Rudolf Laban’s notion of motion factors to weights in an optimal control problem; hence, we are able to produce motion trajectories which are bound or free, sudden or sustained, strong or light, and direct or flexible. The relationship of three of these pairs, laid out by Laban, is shown in the figure to the right, where Laban’s eight basic efforts are shown as pairwise combinations of three of the four motion factors. Our framework produces trajectories between known start and end poses with these varied qualities by adjusting the weights in a cost function. 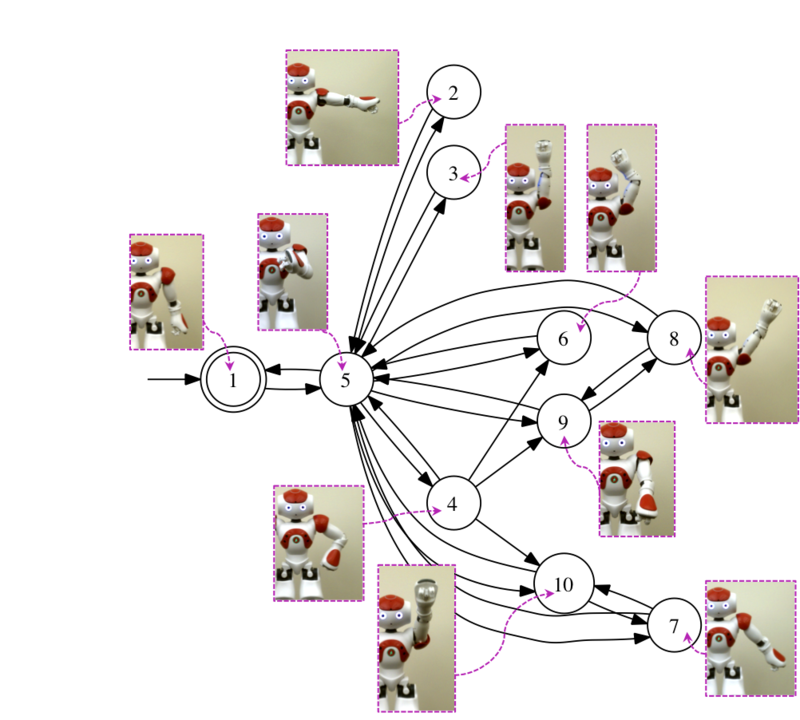 By abstracting humanoid dynamics as poses with a limited choice of atomic movements, we construct an automata-theoretic movement model. However, this simple model allows for a great many sequences which violate basic physical and aesthetic principles of interest. Thus, we control the allowable sequences by amending our model with formal specifications – rules that can be scripted in Linear Temporal Logic (LTL). Through this process, we define stylistic rules that govern how basic motions may be recombined into more complex movement phrases. A. LaViers, and M. Egerstedt. Stylistic Robotic Motion. American Control Conference. Montreal, CAN. 2012. A. LaViers, Y. Chen, C. Belta, and M. Egerstedt. A Formal Approach to the Automatic Generation of Ballet Motions. ACM/IEEE Second International Conference on Cyber-Physical Systems, Chicago, IL, Apr. 2011. A. LaViers and M. Egerstedt. The Ballet Automaton: A Formal Model for Human Motion. American Control Conference, San Francisco, CA, June 2011.